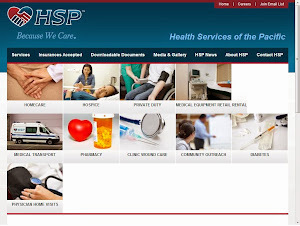 Health Services of the Pacific (HSP) is a health care organization on Guam (a U.S. territory). Our Vision is to develop a dominant model of a completely integrated community – based healthcare system that provides comprehensive health care and health education". Our Mission is to support health and wellness in the community by providing treatment, education and health care services". We continue to focus on health care services in the community and home care settings. Health Services of the Pacific offers reliable, comprehensive health care services to clients in their home and/or in community-based settings. HSP is committed to providing healthcare services to the community of Guam. HSP strives to maintain qualified administrative and clinical professionals. HSP adheres to best practice guidelines, Joint Commission standards, Medicare Condition of Participations and competencies as the foundation of the care provided. WELCOME TO HSP GUAM'S OFFICIAL BLOG. LOOKING FOR OUR WEBSITE, INSTEAD? CLICK THE IMAGE BELOW. Health Services of the Pacific offers reliable, comprehensive health care services to clients in their home and/or in community-based settings. HSP is committed to providing healthcare services to the community of Guam. HSP strives to maintain qualified administrative and clinical professionals.